Justice Snows in Aspen, Colorado is one of my favorite places to eat. I love their eclectic decor, the funky bar, but mostly I love the food they serve. This colorful salad was inspired by one that is on their menu. It's a great winter salad, composed of brussels sprouts, roasted beets, apples, pomegranate and pumpkin seeds, quinoa, and crumbled ricotta salata cheese. With salad like this, winter may not be quite so bad. There is something wonderful about one bowl meals. For one thing, they're so easy. I'm a big fan, particularly when they are this delicious and healthy. 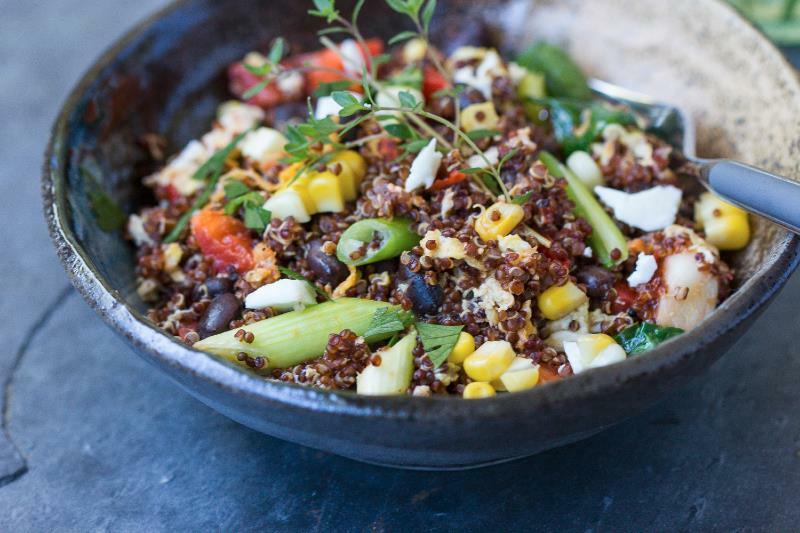 Fresh corn, black beans, and red quinoa give this scramble a Southwestern slant. 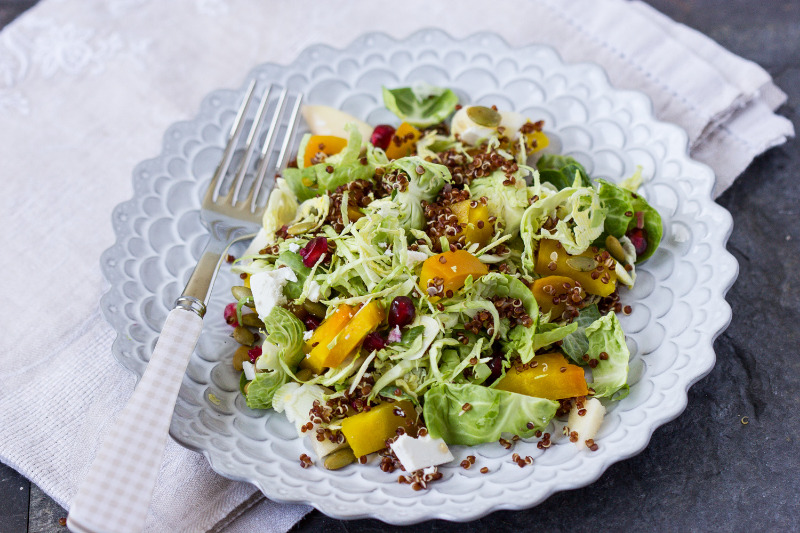 Winter salads differ from the ones we prepare in the summer. For one thing they are heartier, relying on root vegetables, grains, and sturdier greens like escarole, endive, or radicchio. But they are no less delicious or satisfying than their summer counterparts. 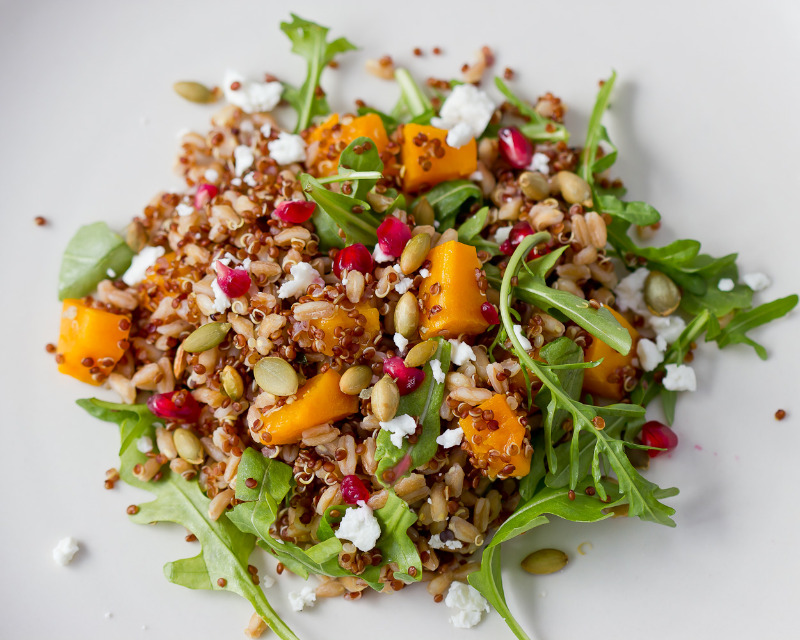 In this lovely and colorful winter salad, farro, red quinoa, and toasted pepitas (pumpkin seeds) provide texture, while the roasted butternut squash and pomegranate seeds add color and a hint of sweetness. Throw in some baby arugula for a nice tang and you've got a wonderful salad to kick start your New Year!